Black & white photogravure [published by Thos Agnew & Sons, London 1893] matted, glazed & set into a natural wood frame. Dimensions: Print: 12 5/8 x 17 3/4 " excluding letters. Sir Luke Fildes's popular masterpiece, The Doctor was commissioned by Henry Tate in 1887, since then the image has been used in many different forms. The United States and Britain put it on postage stamps, political cartoonists lampooned it, and the American Medical Association used it in a campaign against socialized medicine. In more recent times this iconic image by Files appeared in the first Harry Potter movie. There are different stories about the origins of the painting. The most likely is that Tate gave Fildes the freedom to choose the subject matter himself. Fildes’ eldest son, Phillip died of tuberculosis on Christmas morning, 1877. 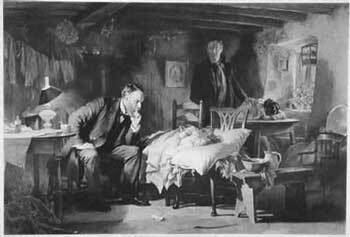 He was attended by Dr. Murray, who impressed Fildes greatly with his care and attention to his dying child. Another version has Queen Victoria ordering the painting to commemorate the service of her own physician, Sir James Clark who she was said to have sent to care for a sick child of a Gillie on the Royal Balmoral estate. Fildes went to great lengths to achieve realism in this painting, by constructing the cottage scene in his studio in London, and painting at dawn to catch the unique character of dawn light. The ‘Doctor’ was a professional model but thought to bear some resemblance to Fildes himself. Therefore, this picture, although based on a real event in the artist's life is in fact fictional. The image has a happier ending than the real life event did, as here the child has survived through the night and dawn is breaking.